I’m sure everyone has those days where you can’t remember how many days it has been since you’ve eaten a vegetable. I guess I’m saying that because I’m hoping I’m not that only one that feels that way sometimes. Our schedule can get really crazy, and all the sudden an oatmeal breakfast followed by a sushi dinner means no vegetable intake for me. When this happened last week, I decided to make this salad for lunch. 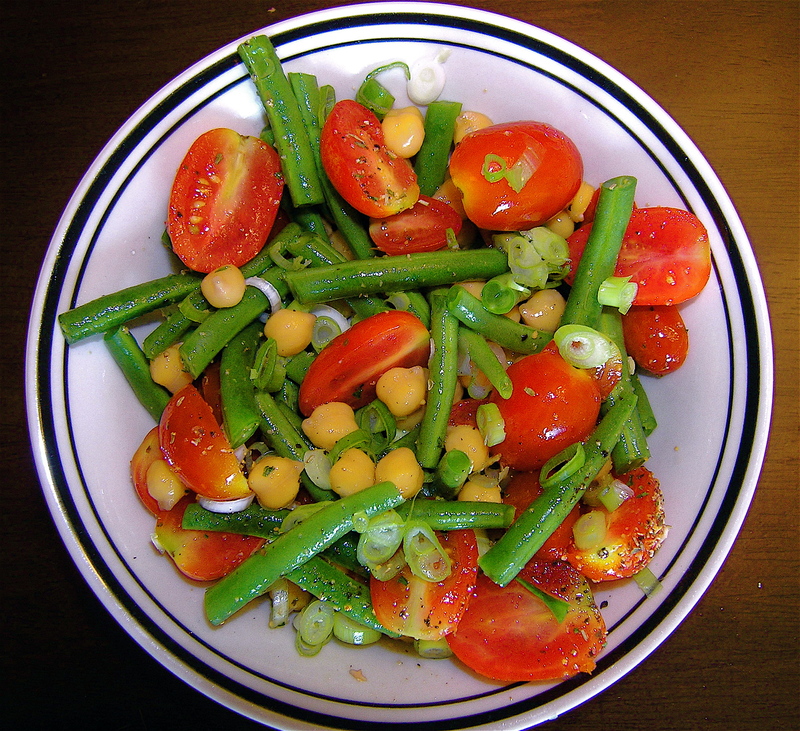 Just crunchy green beans, sweet cherry tomatoes, and protein-packed chickpeas – it’s a wonderful combination. Toss it with the herb vinaigrette (which is great on fish and chicken too) for healthy, hearty flavors. It’s one of those lovely ambiguous dishes that could be a starter salad for a big meal, an entree for lunch, or a great side component to a big cookout. Fill a large pot with about two inches of water. Insert a steaming basket into the pot and bring the water to a boil. Add the green beans and steam for about 8 minutes, or until the green beans are cooked al dente. They should be soft but still retain their crunch. If you do not have a steaming basket, steam the beans in a large saute pan with only 1/2 inch of water. Immediately pour the green beans into a colander and rinse with cold water. Pour the beans into ice water to completely stop the cooking process. Make the vinaigrette by whisking together the scallions, lemon zest and juice, balsamic vinegar, and dried herbs in a large bowl. Drizzle in the olive oil and continue to whisk until the olive oil is blended with the rest of the dressing. Add the green beans, tomatoes, and chick peas to the bowl. Toss well to coat everything. Season with salt and freshly cracked pepper to taste.